10 TIPS+TRICKS FOR TRAVELLING/STUDYING ABROAD. 1. Whatever you pack; you probably will only really need half of it. The mistake everyone makes when going abroad is to pack way too much stuff. You don't actually need that much stuff for convenient survival. Don't pack anything that you can get for cheap in the country you're moving to (pack one towel instead of five, get a second or third one later). If you go abroad for a year, pack 4-5 pair of shoes and wear the heaviest one on the flight (yes, even if it's summer, you can change at the airport after you landed. Those heavy winter boots will make lots of space for other stuff!) I usually pack 1 pair of winter boots, 1 pair of sturdy sneakers, 1 pair of ballerinas/light spring shoes, 1-2 sandals/flip flops (great for showering as well). 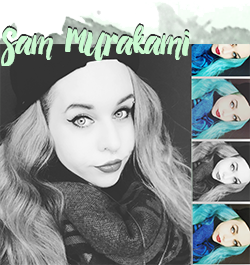 Pack only clothes that you can wear together; try to not make it too colorful and stay with neutrals and some colorful clothes. Pack one formal outfit (1 blazer + 1 pants/skirt/dress) as universities usually have many entrance ceremonies etc. You don't need 4 different handbags (although it would be nice to have, I admit, but you really don't need them.) Try to think rational about what you really need and not what would be nice to have. 2. 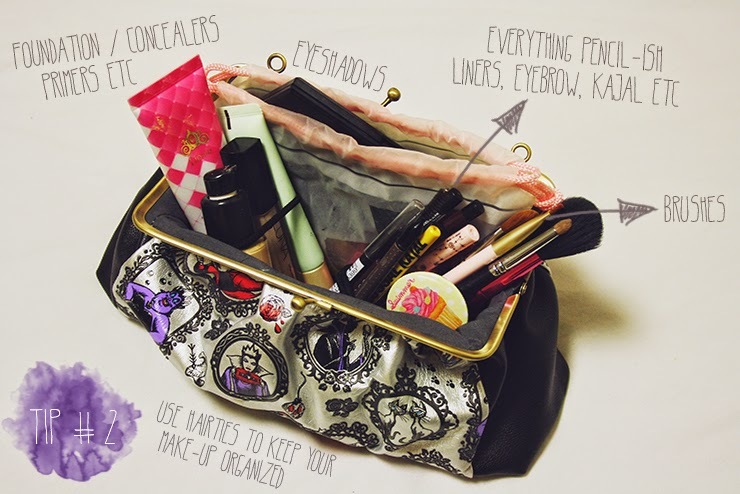 Use hair ties to get your (make-up) bag and pouches organized for easier access and less mess. Hair ties are great for organizing your bags. I use them to keep thematically close items together so that I won't have to search through my bag over and over again. This is something I do at home too to have all my pencil liners together and not always reach for my eyebrow pencil when I am actually searching for my liquid eyeliner. 3. 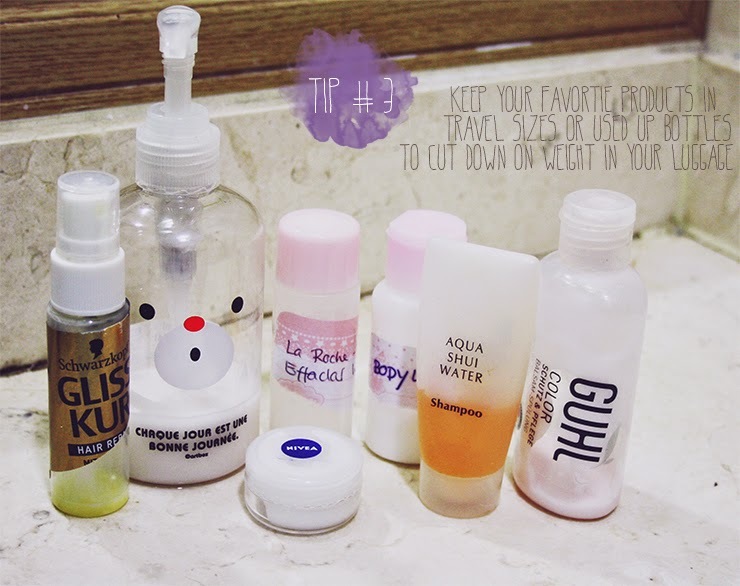 Use travel sized or bottles of used up products to decant your favorite products and save money and weight. Stick the original label on them to avoid confusion. 4. Tote bags. Tote bags all the way. You know, I know that handbags are much nicer than tote bags. But they are also much heavier and need a lot of space in your luggage. Tote bags are so versatile and they need almost zero space and add almost no weight to your luggage! I did pack 3 tote bags in different sizes and designs and have been living pretty happily the last 10 months. Of course I'd rather run around with my Samantha Thavasa bag but I can manage without it. I have a big errand tote which I am going to the supermarket with and two smaller ones that I use for university or going out. 5. If you go somewhere cold or for a year or longer, vacuum your winter jackets and sweaters. Vacuum bags are seriously the best invention since antibiotics or the internet in my opinion. You can save so much space by sucking out the air of all your heavy winter clothing. I honestly never thought about it before a friend told me she always does that when moving across countries and it truly is genius. Also great when you did too much shopping in the country you went to and have to somehow get back home with all that stuff... and the same suitcase you came with. 6. Pouches. Use pouches for everything. 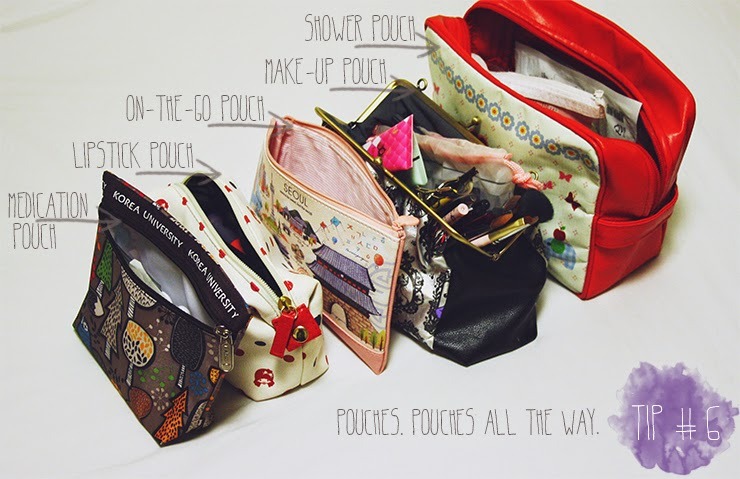 This may be a personal pet-peeve of mine, but....pouches are great. Especially when you are living in a dorm with limited space and shared bathroom space, pouches with different contents will save you a lot of time joggling around. It is also much nicer to pack your suitcase and all you have to do is get the pouch and place it somewhere else, you're done. No cosmetics/medication/lipsticks flying around and probably getting damaged or lost. 7. 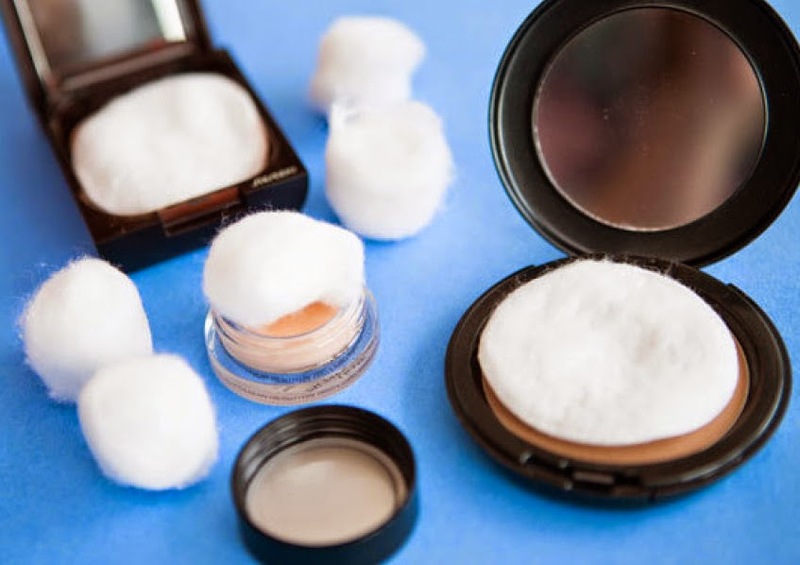 Use cotton pads to keep your powder products from breaking when your suitcase gets thrown around. Especially if you carry around expensive powder or eyeshadow palettes. 8. Save all important information (your passport number, flight information, hotel/dorm/university information, local telephone numbers etc.) not only in your smartphone but also on paper in case you lose your phone or the battery dies. I usually print out a map of my hotel/dorm and the nearest station so I can ask locals/go by taxi in case I absolutely am not able to find it. A physical map is also great when your language ability is not really there yet as point-and-ask works very well around the globe. 9. If you don't speak the language (yet), learn at least the very basic phrases such as Thank You, Please and questions such as Where/Who/What/When to be able to do at least some sort of communication. It's not only polite but will also open up the locals as they most likely appreciate that you at least try. 10. Use your abroad experience to do as much as possible. You will be lazy and exhausted but you should always be greatful for this experience and try to make the most out of it. Bonus: Wear something comfortable yet not too homely if you're flying 10 hours or longer. Being comfortable is super important. And maybe your snoopy pants are super comfortable but you should also chose something that makes you feel good out in the public. Plus, if you look too slacking, you'll most likely get no service at the duty-free counters - do you really want that? I usually go for a pair of black (thermo) leggings, an oversized shirt + cardigan, boots and a scarf as I get cold easily on planes. 2-3 layers are a good rule if you're on a long flight. Plus, I always keep fluffy socks so I can get out of my boots and into the fluffiness for the next 10 hours.